Apparently, Phobia had a tumblr ask blog when she was 8! Curvy ; Diesel Sweeties ; Dinosaur Comics ; Doctor McNinja ; Girly one two ; Love Me Nice ; Octopus Pie ; Sam & Fuzzy ; Scenes From a Multiverse ; Questionable Content one two ; Scott Pilgrim (in vol 3) ; Shortpacked! You know what the best part of any fantasy novel is? The map! Everyone knows a book without a map isn't worth reading. With that logic in mind, I put together a map of how Phobia and Gastro saw the world. The dotted line is Phobia's journey from her birthland to her new home in Ancient Greece. Keep in mind that as a product of the American education system, I'm not exactly an expert on geography. If I got the region in question confused with some other landmass, I apologize in advance. The first comic I ever drew featuring Gastro and Phobia was a presentation comic for the last ever Webcartoonist Choice Awards! This was a great year for presentation comics because Ryan Estrada improved the whole "online ceremony" by introducing some healthy limitations. 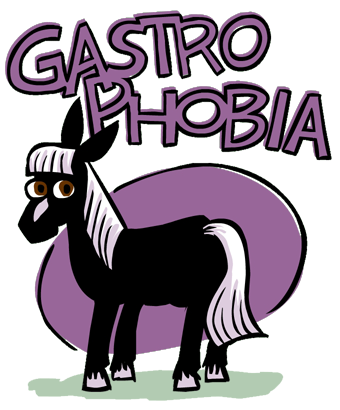 Linking to Gastrophobia is the fun new craze that all the cool kids are doing! Download these fun link buttons! Or don't. Whatever you think is best.